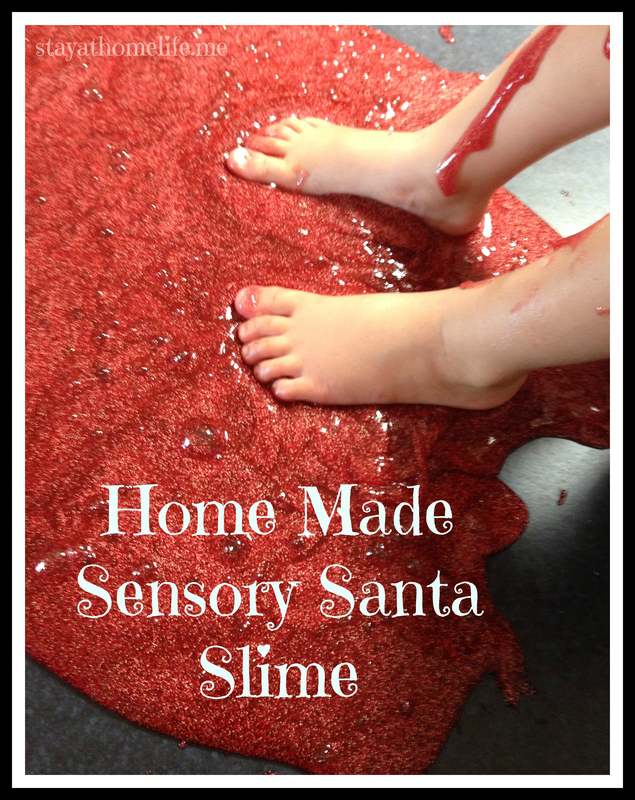 Make Your Own Sensory Santa Slime. Ok, so the school holidays have not quite started here, but this looked like too much fun and I had a fairly light schedule for the day, so we gave it a go. The best part is, unlike normal play dough, it is not going to go bad when stored between uses. Once the ingredients of both bowls are mixed, combine them and mix, the slime will form almost instantly. As I mixed up the ingredients I found it very hard to believe it needed all that water – but it really did, and then some! Not sure if it was because I used so much glitter or because the make up of the glue I used was different than Elmers, but it turned out really firm, almost like play dough, and certainly didn’t ooze like I anticipated. After I got over the initial disappointment, I figured I could either spend another $11 on glue or try to fix it – had nothing to lose, so I added more water to a section of it in a bowl (which did nothing while cool) and put it in the microwave for 2 minutes. Yes, it worked, the slime took on more water and began to get runnier. I continued to do this in sections, increasing the time in the microwave and the amount of water until I had the desired texture. The kids have been having heaps of fun with it, even the older 2. We ended up with about 3 litres of slime after adding all the extra water, so plenty to share between the 4 of them. If I make it again using the same glue, I will use twice as much water from the start, because adding some extra borax to thicken will be a lot easier than adding extra water was!